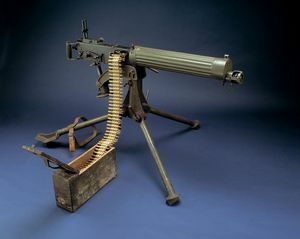 Machine guns were first used during the American Civil War to devastating effect, but advances in technology made the machine guns even more effective during World War 1. They could fire over 600 bullets in one minute and they were so effective that they were considered as "Weapons of mass Destruction. The German Maxim machine gun was fed by a fabric or metal belt, making it a very effective automatic weapon, its relativley small size also made it difficult for the enemy to destroy. On the opening day of the Somme offensive the British suffered a record number of single day casualties, 60,000, the great majority lost under withering machine gun fire. 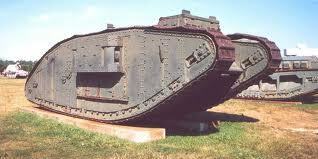 Tanks were introduced into battle for the first time in 1916 by the British, these proved to be unreliable though, A later model played a vital role during the allied advances of 1918, flattening barbed wire,crossing enemy trenches and acting as shields for the advancing troops. 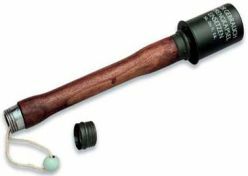 The Germans introduced the Hand Grenade better known as the Stick grenade into the battlefield, they worked in the same way as todays grenades, pull out the pin and throw it. The Mills Bomb introduced into battle by the Brittish looks more like a hand grenade that would be used today. Both of these bombs were designed to cause maximum damage in confined spaces. Much like today's tear gas and mace, this gas caused temporary blindness and greatly inflamed the nose and throat of the victim. A gas mask offered very good protection from this type of gas. xylyl bromide was a popular tearing agent since it was easily brewed. These are the poisonous gases. This class includes chlorine, phosgene and diphosgene. Chlorine inflicts damage by forming hydrochloric acid when coming in contact with moisture such as found in the lungs and eyes. It is lethal at a mix of 1:5000 (gas/air) whereas phosgene is deadly at 1:10,000 (gas/air) - twice as toxic! Diphosgene, first used by the Germans at Verdun on 22-Jun-1916, was deadlier still and could not be effectively filtered by standard issue gas masks. 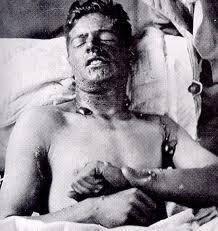 Chlorine gas destroyed the respiratory organs of its victims and this led to a slow death by asphyxiation. One nurse described the death of one soldier who had been in the trenches during a chlorine gas attack. "He was sitting on the bed, fighting for breath, his lips plum coloured. He was a magnificent young Canadian past all hope in the asphyxia of chlorine. I shall never forget the look in his eyes as he turned to me and gasped: I can't die! Is it possible that nothing can be done for me?" It was a horrible death, but as hard as they tried, doctors were unable to find a way of successfully treating chlorine gas poisoning. Dichlorethylsulphide: the most dreaded of all chemical weapons in World War I - mustard gas. Unlike the other gases which attack the respiratory system, this gas acts on any exposed, moist skin. This includes, but is not limited to, the eyes, lungs, armpits and groin. A gas mask could offer very little protection. The oily agent would produce large burn-like blisters wherever it came in contact with skin. It also had a nasty way of hanging about in low areas for hours, even days, after being dispersed. A soldier jumping into a shell crater to seek cover could find himself blinded, with skin blistering and lungs bleeding. At the beginning of the war, aircraft were used for reconnaissance,flying above the enemy lines, helping to direct the artilliary bombardments or to detect and troop movements, it was soon realised though that bombs could be dropped from the planes onto the enemy causing as much damage as possible. 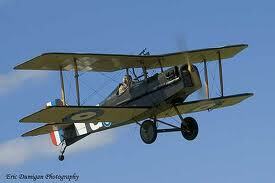 This led to the development of fighter planes, the Sopwith Camel was developed by the British and the Germans retaliated with the Fokker Triplane. The most famous pilots of The Great War was a German pilot named Manfred Von Richthofen, better known as the Red Baron, He was responsible for shooting down over 80 Allied aircraft before he himself was killed when his aircraft, a Fokker Triplane, was shot down over France in 1918. In 1915 the first German Airships or Zeppelin's appeared in the Sky over Britain, they were silent invaders that caused alot of panic amongst the people below, at any moment a hail of bombs could be dropped from the airship. In the early years of the war Zeppelin's could fly much higher than airplanes and it would be almost impossible to shoot them down, this made them useful for bombing raids, although Zeppelins were rarely used and played little part in the war. By 1917 airships were mainly restricted to Naval Reconnaissance because of the invention of incendary bullets and higher flying and faster airplanes. In 1906 Britain launched the Dreadnought Battle ship, which sparked off a naval building programme in other countries. Britain being an Island relied on their fleet of Merchant ships to keep them supplied with food and equipment, built a fleet of battleships to protect the merchants and to prevent supplies from reaching Germany. Although the German Navy did have a few Battleships they took the fight below the surface by building submarines or U-boats as they were better known. The Battle of Jutland off the coast of Denmark in the North sea, was the only major sea battle of the whole war, the battle mainly took place under the sea, as German U-boats fought a damaging war against British merchant and troop ships. Fourteen British and eleven German ships were sunk with great loss of life. Both sides claimed victory. The British had lost more ships and many more sailors, and the British press criticised the Grand Fleet's actions, but the German plan of destroying Britains squadrons had also failed. The Germans continued to pose a threat that required the British to keep their battleships concentrated in the North Sea, but they never again contested control of the high seas. 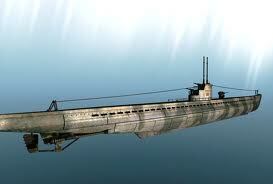 Instead, the German Navy turned its efforts and resources to unrestricted submarine warfare.